First Prize: A Beam of Power (2010), by Bryna Andersen. Image Source: Scientific American/SHIFTBoston. "for her vision of a solar energy collector on the moon. She capitalized on ideas put forth by astrophysicist David Criswell of the University of Houston, who advocates building lunar-based solar-power collectors and sending the energy to Earth via radar beams. 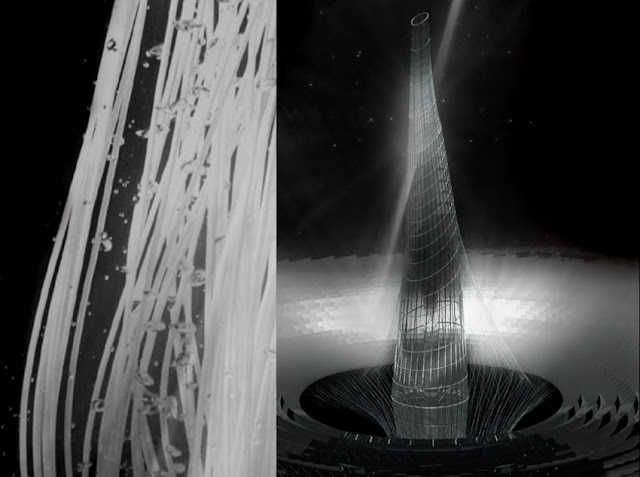 Andersen designed a power tower composed of thousands of fiber-optic cables, built from the moon's powdery soil, or regolith. Her vertical station would also provide energy for a horizontal moon base below, which she envisioned as serving employees and tourists or acting as a research base for future space travel and exploration." 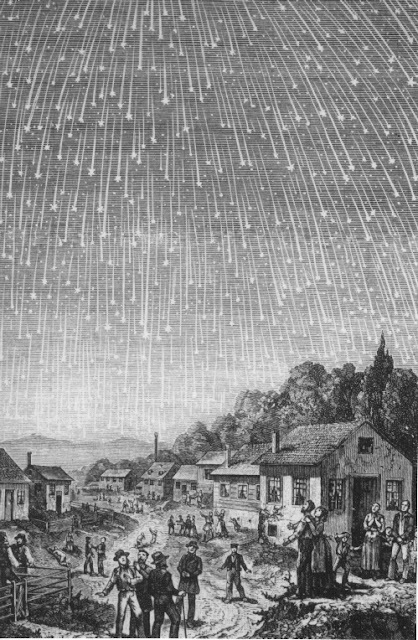 The Leonids in 1833, By Adolf Vollmy (1888-1889). Image Source: Wiki. The Leonids Meteor shower, associated with the comet Tempel-Tuttle, peaks tonight and tomorrow night, with 5-30 meteors per hour after midnight (depending on your location). The best times to watch are between 3 and 6 in the morning near the constellation of Leo in the southeast. There are reports on tonight's Leonids here, here and here. NASA gives you the visibility rate for your area here (you have to enter '13 Leonids,' your location and the date into the site's engine). See my earlier post on Falling Stars. Virtual therapy for burn patients. 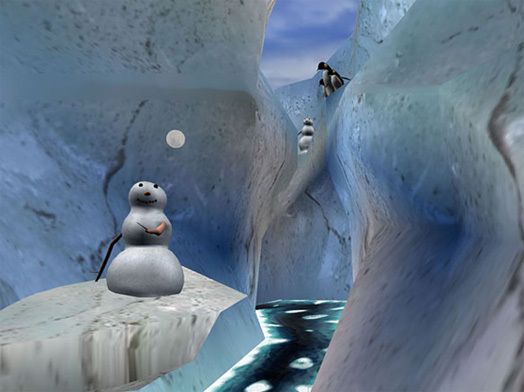 Burn patients can navigate through and interact with a serene snowscape in the virtual reality environment Snow World, helping to reduce their pain. Image: Hunter Hoffman, University of Washington. Image Source: Medil Reports Chicago. A few years ago, I wrote a short story about a guy who had his identity stolen via credit card fraud. The story involved an unknown contender, a thief, a virtual nemesis, a shadowy interloper from the other side of the protagonist's reality, who began charging on the guy’s card everything that the guy had skipped or missed out on in his life. Forgot his wife’s birthday? Up popped the charges for the restaurant, roses, chocolate, lingerie. This led the wife to think that the character was not a victim targeted by a malicious criminal, but that he was having an affair and she began demanding a divorce. He wanted to be a man of action and ideals – when he had become a dusty, frustrated college prof. Up came the James Bond credit card charges in exotic locales. And so on. 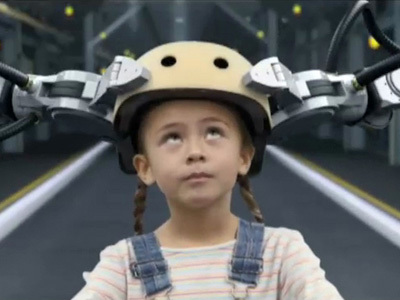 It was a 'Walter Mitty meets his virtual karma in the new century' story. This was back when identity theft was an interesting, novel idea. But these days, 'new and interesting' stays 'new and interesting' for about thirty seconds, and identity theft is now taken for granted. But the core idea to my story is still relevant. Every time we get on the internet, every time we change our names and faces to that of an online avatar, every time we engage with other people through an online no man’s land, there is something unseen, something intangible created. There is an ‘other side’ we can never quite reach. We know people we do not actually know. We communicate in forums and on boards under conditions in which human beings would normally avoid all communication. What is just too risky face-to-face is quite different in the world of relative anonymity. Or so it would seem. We provide our birth dates to Facebook or merchants, we tick boxes that authorize our banks to look at our social networking and Twitter activities. And so on. Chevy robots as helping hands. 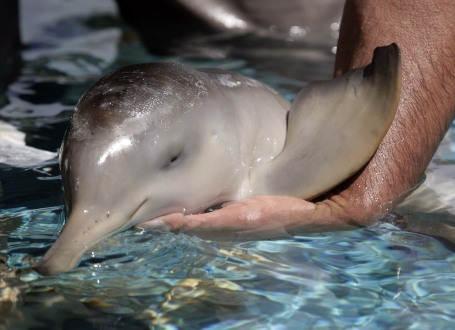 Image Source: Studio Daily. Aung San Suu Kyi. Image: Newagedentists. It's been all over the news that the famous Burmese democratic opposition leader Aung San Suu Kyi was just released from house arrest on November 13. She was imprisoned during the early-to-mid 1990s after being elected, and has been almost continuously imprisoned since 2000. In her first big interview with the BBC (you can see the video here and below the break), she mentioned her first encounter with cell phones this past Saturday night when she met the crowds: "In the long years she has been under house arrest, the world has changed. The internet and the mobile phone have revolutionised the lives of billions around the world - including in Burma. 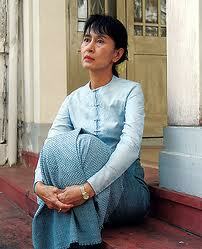 Ms Suu Kyi was allowed to use neither gadget while she was a prisoner. When she made her first appearance on Saturday and saw the thousands of mobiles held up towards her by her supporters who wanted to take her photograph, she was taken aback. She was surprised when she first handled the mobile which someone gave her to phone her son Kim in Bangkok. She had seen them in photographs, but this one seemed so small and inadequate, and she found it hard to know how to listen to it and talk into it." See my earlier post on Retro Telephones. 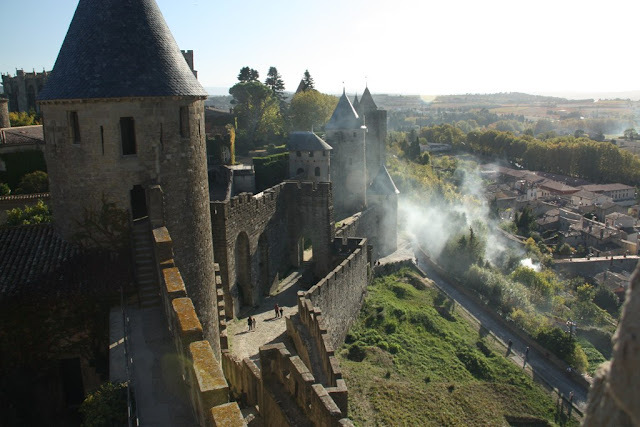 The best bed in late medieval France. 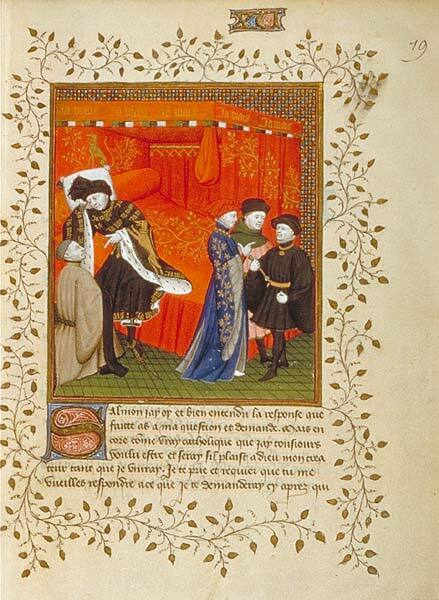 Pierre Salmon, Réponse à Charles VI et Lamentations, France (Paris), 1409 Paris, BnF, département des Manuscrits, Français 23279 fol. 19. Image Source: Bibliothèque nationale de France. Go back to a time before the invention of artificial light and experience a world petrified in the pitch of darkness...when fear ruled the night. Throughout the ages, real and imagined terror existed in the absence of light, and nightime was anything but relaxing. Our predecessors cowered in caves to keep from being eaten alive. During the Middle Ages, brutal bandits went on the prowl and roadside ditches became death traps. Also in years past, the devil, werewolves and vampires were staunchly believed to stalk the night. With no artificial light, the black night sky of Galileo's gaze could illuminate every star without a telescope. There is a transcript of the show (including transcriptions of advertisements) here. 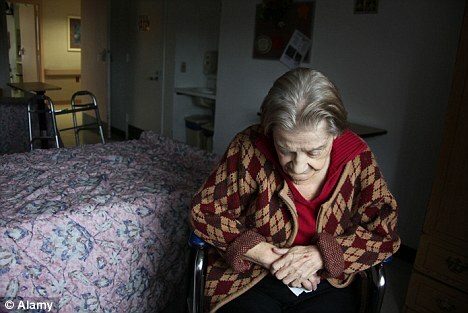 One of the things that really struck me was the claim that people did not sleep right through the night the way we do. They slept in two parts: 'first sleep' (also called 'dead sleep,' 'beauty sleep,' or 'early slumber') and 'second sleep' (or 'light sleep'). They did this because of the lack of technology as well as lifestyle. After hard days of manual labour, people fell into bed when the sun set. They only had the strength for socializing, discussions and contemplation after they had slept for a few hours. The show suggested that when people went visiting between first and second sleep, they often fell prey to robbers on the unlit roads. This is one of those tangible little domestic details that, when we stop and think about it, suddenly makes life from several hundred years ago much more immediate. I was curious whether the show's claims had any historical substance. These details on medieval sleep patterns and nocturnal behaviour are confirmed in a Guardian review of Roger Ekirch's 2005 book on how people used to sleep: At Day's Close: Night in Times Past . Wiki has an entry on segmented sleep here.